Winter break is traditionally a time for me to dig in work hard to fund the upcoming season. This holiday I was adopted by the Pearsons and spent every waking moment at the Wills factory while all their employees were away, allowing me to work on a lot of projects without getting in the way too much. The pod mold is done, jigs are built, an infusion pump arrived, and it’s just a matter of ordering a few bits of material and glue to start the transition to resin infusion. Looking forward to that, but the need for $$ has shelved the project for another few weeks. 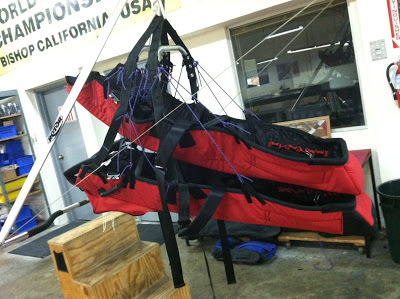 The primary project last month was to build four tandem harnesses – that is, eight cocoons. Feedback from my last two customers resulted in some major improvements this time around. 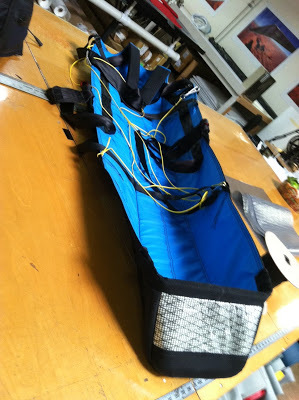 I was using a straight pattern to build the last few harnesses but switched to a pattern Steve Pearson gave to me that’s basically the bottom half of a Z5. The harness seems a little more supportive than before. 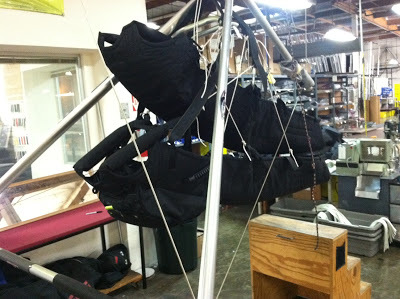 After shipping the harnesses and building one more just to have in stock, I started in on some of my own projects. My covert got its annual overhaul with an updated foam liner, new teeth on the pitch lever gripper, and new bungees throughout, along with a vacuuming and a wash. Looks amazing as it just about finishes two years and 500 hours of flight. Using the same pattern as used on my tandem harnesses, with an eye for simplicity and minimalism in every aspect of construction, I managed to finish this cocoon at just a hair over four pounds. 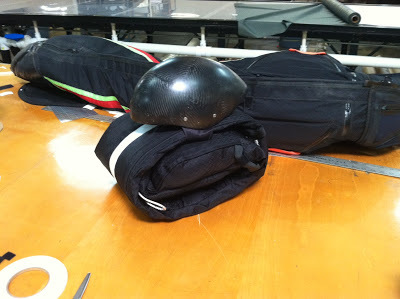 Weight in a drawstring, ultralight bag, with lara gold 175 chute, 5/16 quicklink as biner, and lubin helmet: under ten pounds….. Using scraps of odl06 literally from the trash can, along with other scrap laminate cloths in places where heavier woven fabric wasn’t necessary helped save a little here and there. 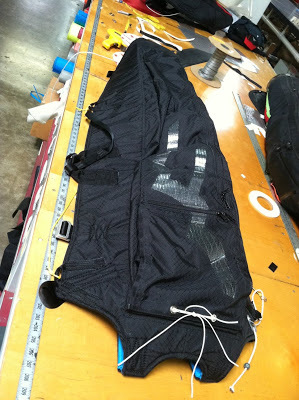 I went without legstrap padding or buckles, and the backstrap cincher is aluminum. The interior cloth is light but could be lighter! There is plenty of room for improvement but for now it will be cool to put the entire harness kit in my backpack in the overhead compartment..